From the same creative team that gave you “The Alan Gilbert and the Grand Macabre” show, New York Philharmonic presents you the CONCERT CAB featuring Principal Oboe Wang Liang and Assistant Timpani Kyle Zerna. 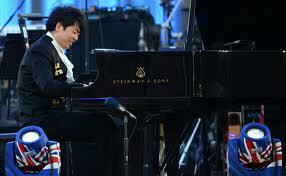 Technically, Lang Lang wasn’t the only performer from a non-Common Wealth country in that concert. Renee Fleming and Stevie Wonder were the other two. (Fleming sang from the balcony of the Buckingham Palace nonetheless!) But I guess since they are from the America, which was a former British colony, we’ll let it pass. I understand Mr. Rhodes’ frustration. Is the Jubilee Concert supposed to be a showcase of British talent? Arguably so. Are there good British pianists? Surely there are. But is there another pianist who is also a household name worldwide? Arguably not. Rhodes suggested three other British pianists – Stephen Hough, Paul Lewis and Benjamin Grovesnor. He also suggested that the reason they were passed over was that Lang Lang has a big record company (Sony) with better connection and deep packet. I’m not too sure about that. I think the simple reason is that Lang Lang is more entertaining than anyone else: Just look at the way he dressed – faux military ceremonial suit – and the way he selectively played only the flashiest parts of two two pieces – Hungarian Rhapsody which sequed into Rhapsody in Blue. It’s clear this is not the occasion to be subtle and understated but to make the biggest gesture on an outdoor stage where tens of thousands of people congregated to be entertained. To suggest this four-minutes performance could have been an advocacy for the classical music is hoping for too much – even for a queen. Lang Lang had a very busy weekend. (So, what’s new?) 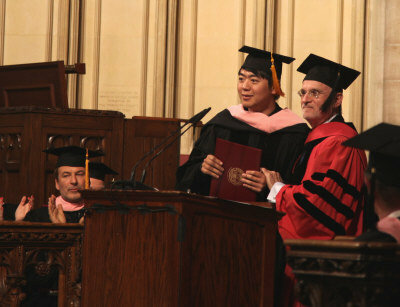 On Friday (May 11), he received a Degree of Doctor Musical Arts, honoris causa from the Manhattan School of Music. The next day, he played a sold-out recital (again, what’s new?) at the Lyric Opera of Chicago. Neither Puccini nor Verdi was on the program. Instead, Lang Lang played Bach, Chopin and Schubert. The same program will be repeated later this month at Carnegie Hall. Propelled by a shared passion for classical chamber music and profound respect for the works written by the composers of our time, the New Asia Chamber Music Society was founded in 2010 by an idealistic group of young Asian-American virtuosi, graduated from America’s most prestigious music schools, including The Juilliard School and the Curtis Institute. 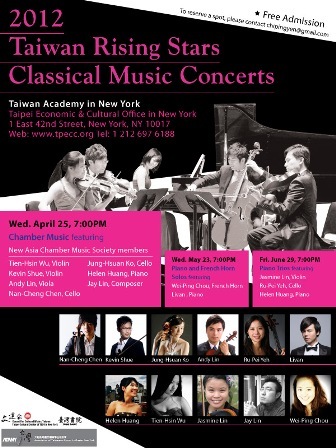 Based in New York City, NACMS is committed to bringing audiences exceptional performances of the finest works of chamber music, drawn from the canon of western music as well as contemporary Asian culture. This unusual young collective also seeks to reach out to its technologically-wired peers around the world, through the creation of innovative new work in future partnership with other arts organizations. Musicians in New York are a-plenty. Hey, it’s almost impossible to go through a Subway ride without encountering one (or more) of them! So young musicians need to put on shows by themselves. And finding a venue is usually the most difficult. So what if it’s in an office building? At least they don’t have to compete with the roaring trains, not to mention the rats! 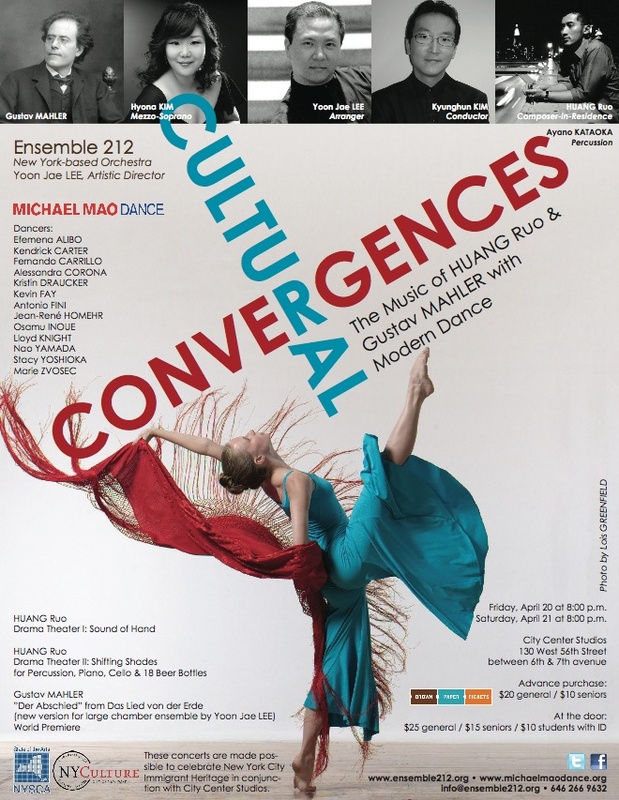 Composer Huang Ruo and choreographer Michael Mao come together for two performances of “Cultural Convergences” this weekend. Mao has made three dances , two to Huang Ruo’s music: Drama Theater I: Sound of Hand and Drama Theater III: Shifting Shades. The second is played by percussion, piano, cello and 18 beer bottles. Presumably beer will not be consumed on stage! Sound of Hand probably will have a lot of clapping. Huang Ruo is a composer interested in unusual sounds. Even when he uses traditional instruments, they always sound different. The last piece will be danced to Mahler’s “Der Abschied” from Das Lied von der Erde (in a new version for large chamber ensemble by Yoon Jae Lee). Since the lyrics of the song cycle are Chinese poems from 1200 years ago, this is a fitting conclusion of the “Cultural Convergences” theme. Although without lyrics, the dance may not need to stick to the “Farewell” theme. We’ll see. Yuja Wang played a stunning Prokofiev Concerto No.3 with the New York Philharmonic on Thursday. Her technique was impeccable, with fingers running and jumping up and down the keyboard while making every note crystal clear. But what stands out even more is her music taste, which is quite clear in the slow passages. She played the concerto brilliantly yet so matter-of-factly like it’s the easiest thing in the world. She didn’t play to the audience but had the audience in her palm completely. She didn’t play an encore on Thursday. Maybe she was saving it for Monday, when she and Maestro Jaap van Zweden will meet the audience at the David Rubenstein Atrium (Broadway and West 62nd Street). They will be interviewed by WQXR’s Jeff Spurgeon.